And thus the location now known as Cannon Beach, Oregon first enters into written history. The area was nearly inaccessible except by treacherous trails over steep hills. Clark only entered the area in search of some whale fat, but found that the reported carcass of a blue whale washed up on shores had already been picked clean by the native Clatsop Indians. Clark and party stayed for three days, and he named what is now Ecola Creek, “Ekoli,” a slight corruption of the Chinook word “Ehkoli” which means whale. The next day he described Cannon Beach’s most famous sight, and perhaps one of the most iconic views of the entire Oregon Coast, Haystack Rock. He managed to trade for 300 pounds of the whale fat before returning to Fort Clatsop. Later settlers renamed the creek to Elk Creek and a small community sprung up nearby. On September 10, 1846, despite having spent a full day resurveying the bar, the US Naval Schooner, USS Shark still managed to strike an uncharted shoal just after crossing the Columbia River Bar, and started to sink. A large portion of the wreck floated down to Cannon Beach, where all the crew managed to make it ashore. Oregon Historical Quarterly #14 has a recollection of the wreck written by Burr Osborn, one of the survivors. On thoroughly examining the chart you recently sent me, I am convinced that we struck the breakers south of the channel, the wind at the time being westerly and on the flood tide. 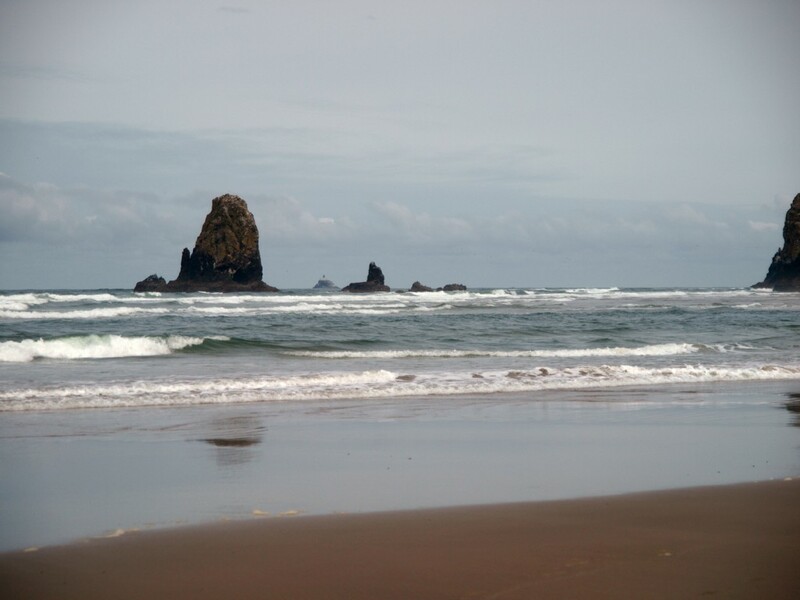 We landed on Clatsop beach several miles down the river from Astoria, between nine and ten o’clock in the evening, the tenth of September, 1846, and our first landing of half of the crew was about daylight. Surveying of the site was completed in 1879, a second and more complete survey in September of that year claimed the life of famed engineer John Trewavas. Word of his death reached many locals and workers suddenly became hard to find. Only by bringing workers from a distance away and keeping them sequestered was construction finally started. After weathering several storms themselves, including a storm on January 2nd, 1880 that managed the wash away the storage shed holding most the workers tools and supplies, and left them stranded for sixteen days, work on the lighthouse steadily proceeded. Exactly a year later, as the Lighthouse was nearing completion, the British bark, Lupatia was on a collision course for the treacherous rocks. Workers on the rock managed to light off bonfires, but too late. The Lupatia veered off the rocks but crashed into Tillamook Head. The ship’s dog was found alive the next day, but all sixteen crew members perished in the wreck. Three weeks later on January 21, 1881 the lighthouse was lit for the first time. It quickly became known not only for the engineering marvel needed to build it, but for the challenging assignment keepers found themselves faced with. In 1891, James Austin built the Austin House, a hostel just south of Tillamook Head at what is now known as Arch Cape. His decision to do so was purely strategic. As the former postmaster of Seaside, he knew that this location was the rough halfway point of the Tillamook-Astoria Mail Route and thought it’d be a good spot to serve travelers and postal carriers. Local lore stated that one of the ship’s cannons had been stashed in a nearby creek by a midshipman and several indians for safe keeping. But it was soon lost in the sand. Austin hoped to reap the rewards of the cannon being rediscovered on his property. Cannon Beach’s first steps into the tourism trade officially began with the purchase of the old lifesaving station by several prominent families from Portland. They reached the area via a road cut directly into the rock of Tillamook Head. Another winter storm in 1898 finally made Austin’s gamble pay off. The storm shifted enough sand to uncover the previously hidden cannon from the USS Shark. Austin and neighbors moved it to a location in front of his hostel, but it ended up changing hands multiple times. Tillamook Head Lighthouse was finally closed in 1957. Replaced by a whistling buoy, the lighthouse faithfully served for 77 years. It’s history since then has still be controversial, but the rock is now part of the Oregon Islands National Wildlife Refuge and is home to not only seabirds, but 30 urns of the deceased who paid to be “buried” at the Lighthouse. One of Simon Benson’s “cigar shaped log rafts,” (Benson is also famous for spearheading the building of the Columbia River Gorge Highway,) broke up. Remains from the experimental raft were used to build the Hotel Bill in 1904. The hotel played host to President Woodrow Wilson in 1914 and remained in use until after WWII. In 1922, the Post Office Department officially changed the name of the Ecola Post Office to Cannon Beach. This was done partially due to increase popularity of the name after finding the cannon, and partially to reduce confusion with the Post Office at Eola, where mail was continuously mis-delivered. Mel Goodwin finally purchased the cannon and moved it to a location on Highway 101 in 1956. It was later moved to the Clatsop County Heritage Museum in Astoria and replaced with a replica. As part of the “Ring of Fire,” a tsunami caused by a 9.2 Earthquake off of Alaska (at the time the largest Earthquake recorded,) hit Cannon Beach on March 27, 1964. This wiped out the northern bridge, and tourism to the beleaguered town quickly dropped due to fear of another tsunami. To combat this, Cannon Beach held it’s first annual Sand Castle Contest on July 29th, 1965. Due to this contest, the town remains a heavy tourist destination. 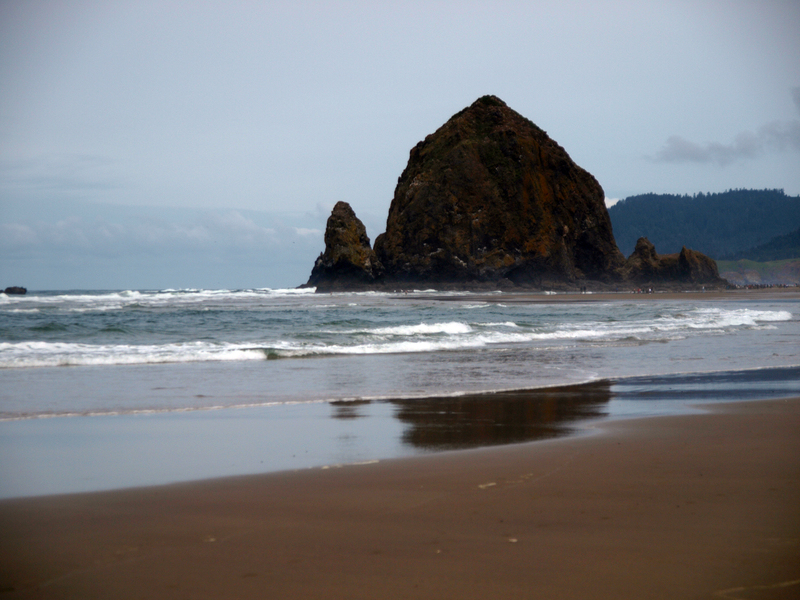 Due to it’s scenery, Cannon Beach has been used as the set for several movies, most notably “The Goonies” in 1984, and “Twilight” in 2008. In 2008 the saga of the USS Shark literally resurfaced. Winter storms uncovered not one, but two more of the original cannons and a portion of the chain used to hold one to the deck. The original one had already been removed from Astoria and brought back to Cannon Beach. But these new discoveries caused another surge in tourism as archeologists worked to save these important artifacts. My grandfather, Roy Becker and his father built the original Cannon Beach hotel (THE Becker House) .in 1914. I lived there 1946to 1947 as a child.